We’ve got more options than ever. If you still love to watch your shows live, then streaming services may be for you! Streaming live TV gives you the freedom to pick channels and the flexibility to choose the best TV for your house – and your wallet. Traditional TV and Streaming TV are pretty much the same thing! Today you can try any one of these to watch Live TV and more – and save big time. Many of these options are similar and familiar to what you have at home today. We’re breaking the internet speed barrier with more bandwidth and faster speeds! Eligibility for the Roku offer (“Offer”) is limited to new residential customers only. Requires minimum purchase of 1000 Mbps (1Gig) Internet, modem rental and Enhanced Whole Home WiFi services. Offer is subject to change at any time with or without prior notice. 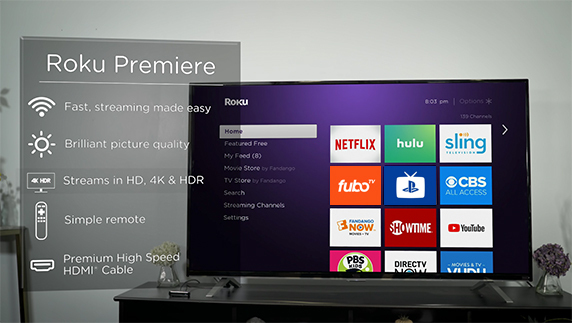 Offer limited to 1 Roku Premiere streaming player (model 3920) per qualifying account. Offer begins on November 1, 2018 and good while supplies last. Qualifying services must be active at time of fulfillment. Roku Premiere streaming player will be mailed via USPS to service address approximately 2-4 weeks after installation and is nonrefundable. Offer is run by Grande Communications Networks, LLC only. Roku, Inc., its parent companies, affiliates, subsidiaries, advertising and promotion agencies and all others associated with Roku, Inc. are not affiliated with or connected to the Offer. © 2018 Roku, Inc. All rights reserved. ROKU, the ROKU Logo are trademarks and/or registered trademarks of Roku, Inc.